With the release of the new LEGO Sydney Opera House, I have decided to offer its companion, the Sydney harbour Bridge as its own LEGO set. This is a very rare opportunity for you to own one of my designs and also have an amazing part of Australia made out of LEGO. All you need to do is click “support” and once it his 10,000 likes it is on its way! However there is only one problem, it is missing its equally as famous and just as significant twin, the Sydney Harbour Bridge. These two inseparable icons form the backdrop to one of the most famous harbours in the world. So here is your chance to have the companion model. Designed by Australia’s own LEGO Certified Professional; Ryan McNaught. The Bridge brings new and interesting modelling techniques as well as an amazing looking model. • Each tower whilst looks the same uses a different construction technique, thus avoiding the dreaded x4 often seen in LEGO instructions. • Includes Sydney ferries and a myriad of mini cars and trucks. • Teaches important concepts such as making curved models out of rectangular bricks. • Advanced Half stud offset technique used in all 4 towers. • Measures over 90cm long, 30cm wide and 30cm high. Click HERE to support it! LEGO Laval from the Legends of Chima. Here’s a bit of a behind the scenes look at my latest model. 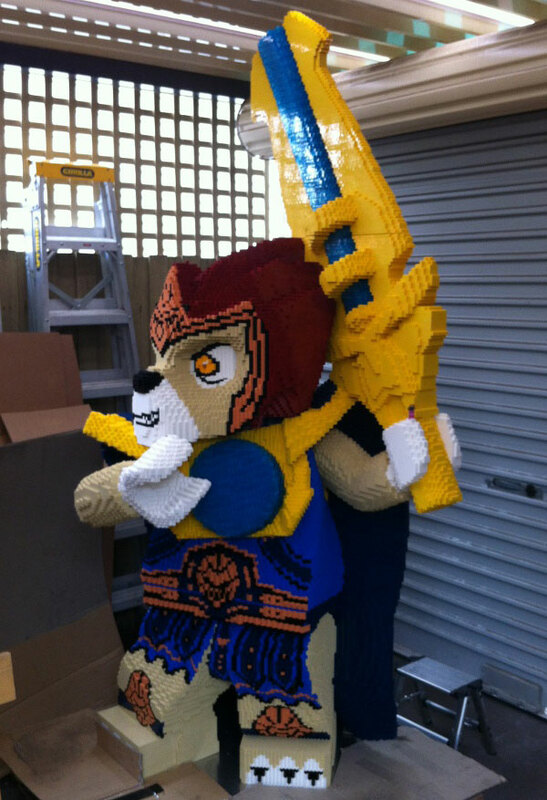 A giant LEGO minfig called Laval from LEGo Legends of Chima. He is just under 6 Ft Tall and with his sword its over 8 feet tall, and well over 100,000 LEGO Bricks! Here’s a picture of him in the loading dock just before he heads off to a department store. All up he was about 280-300 hours worth of work, and a hell of a challenge.